When we moved to Canberra in late 1976 I was heavily involved in CB radio as well as my motorcycling hobby. Not just local communications but chasing the “skip” and talking to people all over the world. It all seems rather primitive now and it was fun while the sunspot cycle lasted but, around 1981 the skip started to die and 27mhz CB pretty much died with it. Not long after arriving in Canberra I started fraternizing with the local CB-ers both on air and in person and one of the first ones that I met was a young bloke who lived just up the street from me. As luck would have it, he was also a keen motorcyclist, owning an almost-new RM125 Suzuki motocross bike. Having two hobbies in common meant that we soon became fast friends. Al was a member of MCC and raced at Fairbarin Park and he took a keen interest in the founding and development of CRRC, assisting with most meetings we ran on the closed street circuit at Macarthur in a number of different ways. One innovation that we introduced to the race meetings, remembering that this was 1978, was to have every flag marshal point covered by not only a pair of flag operators but also a member of the local CB club who provided radio communications right across the circuit. When the group of kangaroos invaded the track in the middle of the 350 A Grade race in 1979, it was quick communications from our CB spotters that helped to avoid what could have been a nasty situation. 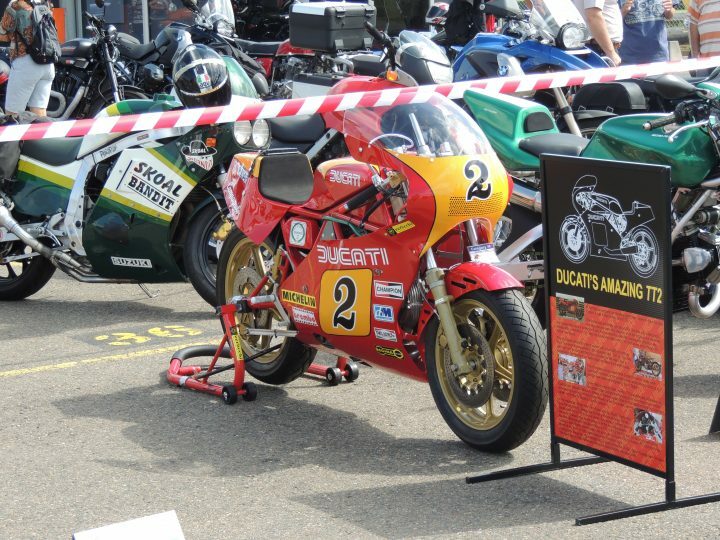 At various times during the next 30 years I ran into Al, usually at race meetings and usually working with a racer who was riding a Ducati, since, in my absence, he had become one of the Ducatisti. Being already friends with Axel Martinsen and the various members of the Ducati clique in Canberra meant that it was inevitable, really. Al started his own screen printing business that morphed into a full-blown signwriting and vinyl-cutting business that now boasts many high-profile Canberra businesses among its clientele. And so it was that, when I started on the Shadlwfax rebuild, Al put his hand up to do the vinyl work that would be required to accurately duplicate the bike’s original paint scheme. It is history, of course, that he did so with spectacular success. 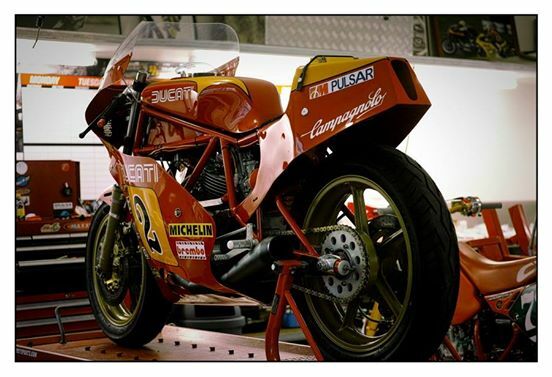 In fact, though it was never my intention, the bike looks far better than it did in the day, due to Al’s efforts and the very diligent paint job done by Paul Campbell at Redback Racepaint. About 12 years ago, toward the end of a mid-life crisis, a decision was made to start the search for a project bike. Early options included TZ250’s or 350’s and even an AS1 Yamaha. 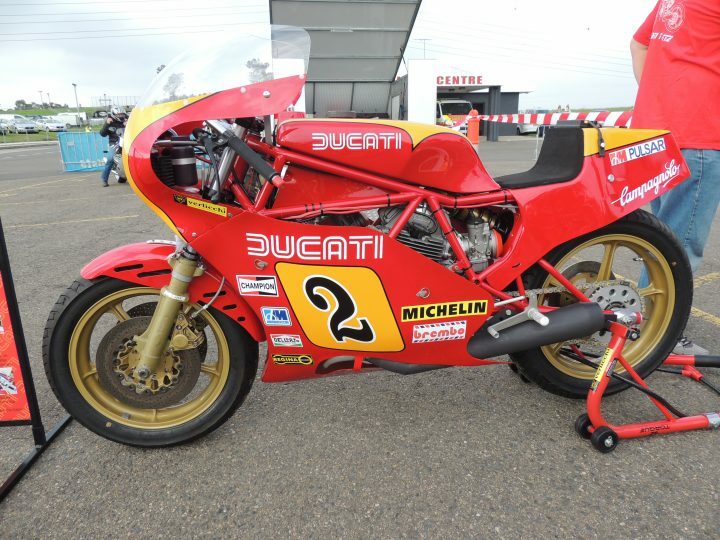 But some advice from a friend of mine opened up another option that maybe a Ducati TT2 might be possible and after some intense negotiation, I was able to obtain a bike that had the basis of a good road bike with quite a few original parts that I knew the origins of. These parts included an original Verlicchi frame and swing arm; Campagnolo Magnesium wheels 18” rear and 16” front; a Marzocchi Pulsar rear shock; Marzocchi magnesium GP forks; TT2 triple clamps; complete set of Brembo Goldline front brakes and rear Master Cylinder; a good tank and a pretty tired motor. These were once a very tidy road bike but the years had not been kind and a full restoration was required. The bike was stripped down to the bare frame; wheels; suspension and motor – as far as we could go. The frame and wheels were sand blasted and painted. My early thoughts were to return her to the road in the endurance colours of red, blue and white but the project stalled for the first time due to a number of issues and I had time to reflect on my project. As parts were collected over a number of years I decided it would be a sacrilegious act to build a road bike and the red, yellow and black colour scheme was calling. 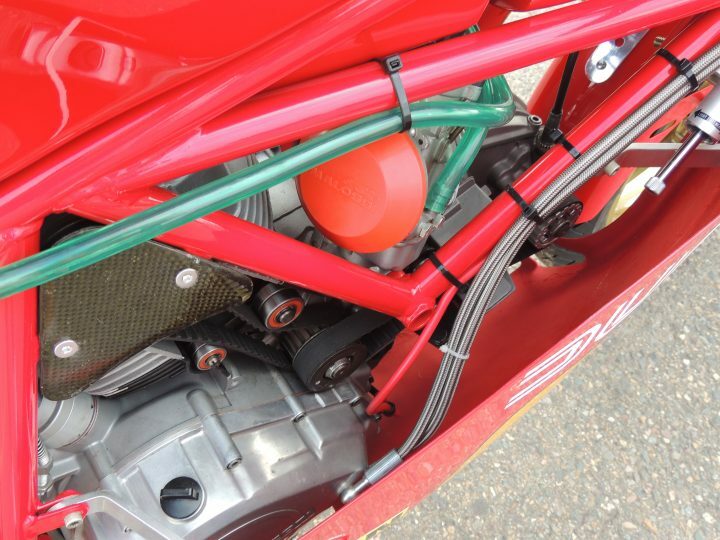 So the final direction was clearer – an accurate TT2 replica was to be built! I was very lucky to have access to a largely unmolested 16”front wheel TT2 to use as needed for a reference tool. So the parts we needed to manufacture were focussed on. A rear brake torque arm made by Pete Smith from Epicycle was dug out of the spares box; the rear caliper hanger and rear disc appeared from the same box. The header pipe was usable so a megaphone was required. We ordered one from Italy, which didn’t even go close to fitting so it had to be completely re manufactured (my trade as a sheet metal worker came in very handy) and when completed it fitted like a glove. 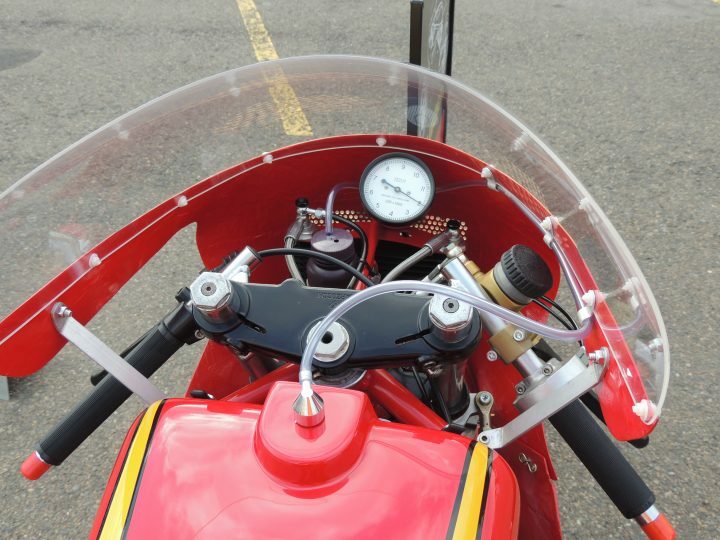 Next we addressed the front fairing mount that also doubles as the tacho and oil cooler mount. Then the front mudguard and fairing mounting brackets. An oil cooler was sourced from Belt and Bevel in NSW. 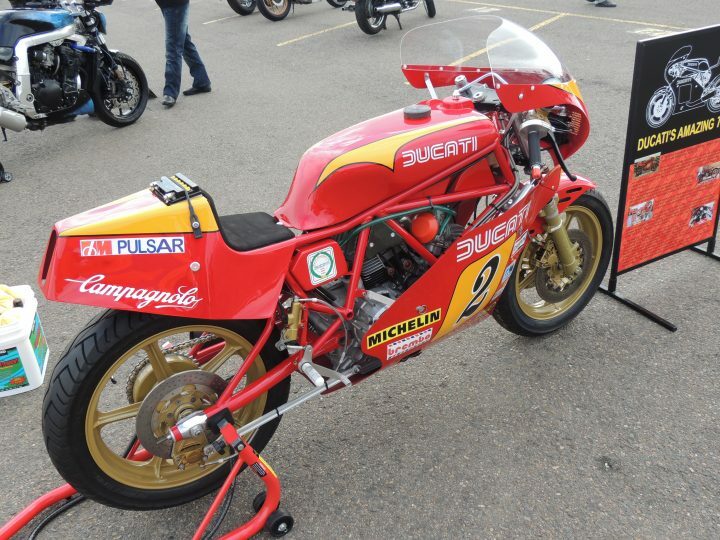 A set of fairings were struck from moulds taken in the eighties from the reference bike. These were fitted up and then sent out to Redback Racepaint to be prepped and painted red and yellow. When I received them back I brushed on the black pinstripes just as the factory did in the eighties. Now it was time to think about the motor, well it was put aside and a very strong, full F2 spec motor, that I already had, originally built at Epicycle some years ago. The F2 spec motor was dismantled and some new goodies were sourced. Again, the crank, Carillo rods and single ring race pistons were sent to Epicycle to be rebalanced before being reinstalled into the freshly bead blasted cases with a new set of bearings right through. The barrels were lightly honed. The heads were stripped and bead blasted and reassembled with the Vee Two cams which were dialled in with the help of a set of Vee Two pulleys. The squish and compression were checked and found to be very pleasing. The clutch cover was altered to allow for the two oil lines to be fitted. Then a set of cam end covers were drilled and tapped to suit 10mm banjos. Now the nitty gritty started – the assembly for about the fifth time but hopefully that would be it! A set of Malossi 41.5mm carbies and a Veglia tacho were sourced from America. Some genuine Verlicchi handle bars were acquired from Italspares. Braided lines for the brakes were made up at Neil Bates Automotive. The oil lines were made to suit and the wiring was done. By this time things were looking good and the decision was made to make some noise and so she was started! With a video recorder and two friends who are very familiar with TT2’s (as one rode and one owns my reference bike), we were all very pleased (see youtube video TT2 First Run). The body work was to be fitted again and some tasteful period style decals (manufactured by myself) were installed. Some 13mm x 8mm green fuel line and the fuel tank overflow set up was replicated. Then, one Saturday afternoon in March 2014 I stood back and admired my creation and a small tear was shed! This project was completed without compromise, using no replica parts. All the major parts are genuine period originals except those that the Race Department would have made in house and I have done the same. I hope I have respected this classic mark in my replica. 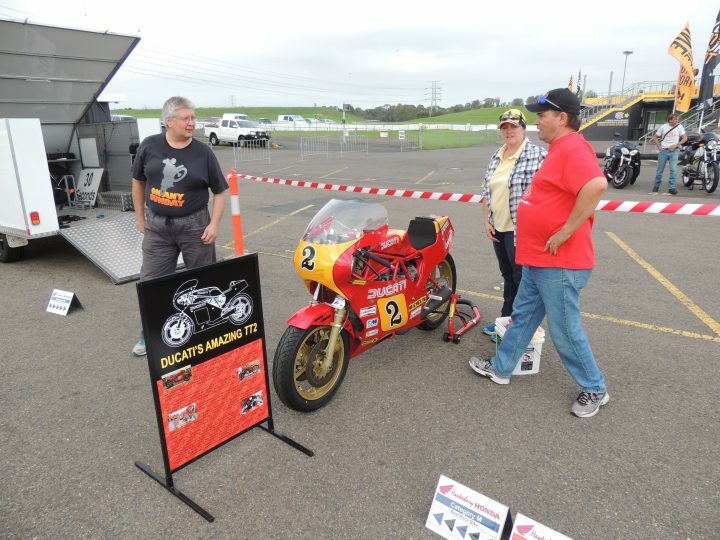 I should also add that the bike’s public debut was at Sydney Motorsport Park for the Barry Sheene Festival of Speed. The bike attracted a lot of attention in Sunday’s Show and Shine and capped it all off by winning the coveted “Best Race Bike” trophy. 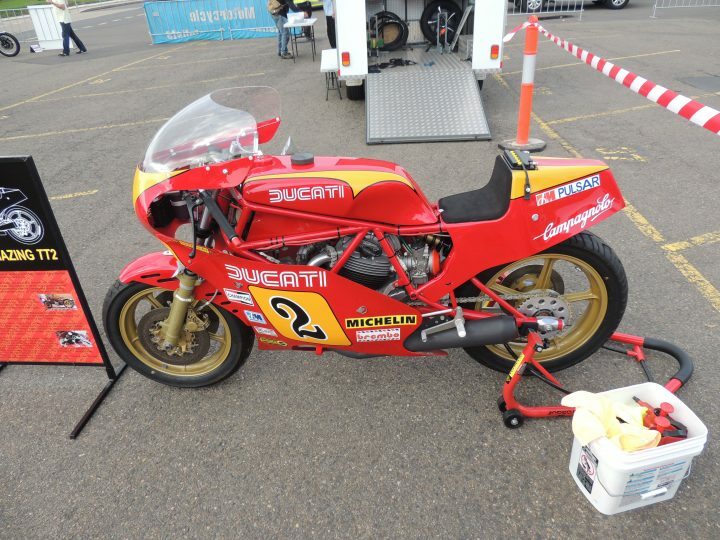 Below are some photos that I took at the Sheene this March and also one from last weekend when Al took the bike to Queensland to participate in the big Club Laverda Concours. He picked up a 2nd place overall trophy for his efforts.